Education reformers rarely talk about the real issues. It’s not necessarily the schools themselves that are the problem — it’s the geography. We know the good schools are in the expensive neighborhoods. Of course, this is a barrier to low-income families to attend those schools. But it’s not necessarily the teachers, administrators, class sizes, or even the budget that makes those schools better. It’s the students. Well, sort of. We know that concentrated poverty leads to bad outcomes in city neighborhoods. Well, it’s the same for schools. Family socioeconomic background influences a student’s academic achievement by providing more resources at home, but peer groups are often more influential to learning than socioeconomic background alone. Predictably enough, family income plays a role in whether a student applies for college, too. This isn’t to say that a student’s socioeconomic background is his or her destiny. There are programs that get disadvantaged students the education they need. But when you’re looking at a school with 1,000 students, you can make some pretty solid predictions of the average test score if you know the student body’s average family income. You can see this trend where the entire school district is impoverished of course, but you can see it within school districts, too. Schools with the same funding levels, same class sizes, and same policies, can have vastly different grades. And they’re absolutely tied to the student body’s socioeconomic background. So what’s the solution? Socioeconomic integration. 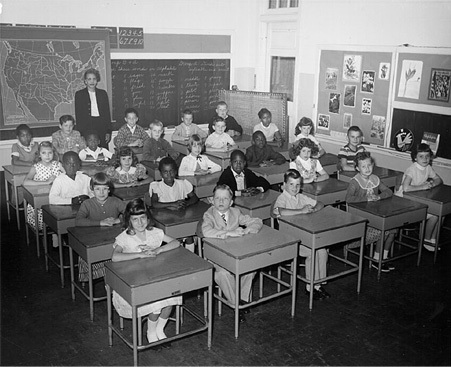 Not so long ago, school districts used to try to integrate students through busing policies. It was mostly because they were being forced to integrate racially, but because so many black families were (and are) living in poverty, these policies integrated students economically as well. Busing was rarely popular, especially in affluent schools, and it’s not used much anymore. Instead, schools now are trying to integrate through more of a market approach. School districts created magnet schools by concentrating resources, adding special programs (Mandarin Immersion, anyone?) in schools located in racially- or economically-isolated neighborhoods. Now the affluent white students bus themselves and the school district is more integrated than if attendance zones were based solely on neighborhood boundaries. There’s promise for charter schools to act this way, but they’re often more segregated than neighborhood schools. The problem is, purposefully integrating schools is a giant shell game. While low-income students are stuck in the same neighborhoods, high-income families can avoid integration relatively easily. They want to send my kid to what school!? Not a chance. She’s going to (take your pick) private school, Catholic School, Montessori School. Or, we’re moving to the ‘burbs. And, the larger the city, the larger role geography plays. Low-income students often need to overcome great distances and travel time to attend integrated schools. And where district lines are drawn between rich and poor, you’re stuck. Some people are looking for solutions in housing policy. Integrate the schools by integrating the neighborhoods. Gentrification can be a bad word, but I’m of the opinion that there’s more harm in the urban sprawl caused by school chasing than by high-income families moving into cities. Besides, there are many successful urban housing developments that make provisions for low-income families and create mixed-income communities. Limiting the amount of subsidized housing and thus lowering the poverty density of a given area can also influence who attends what school. It seems that the ultimate solution is to look beyond the free market. The widening gap between rich and poor is going to exacerbate this issue. And failing our students isn’t the best long-term plan.